• No. 10 Lemongrass + Neroli is a perfume for men. 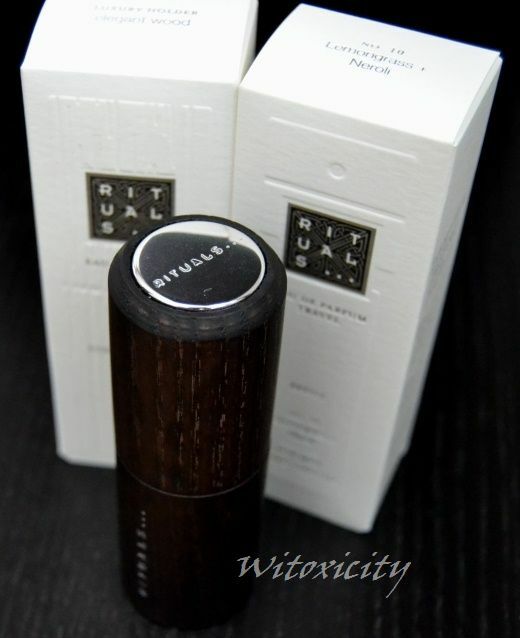 • It is a new release by Rituals, making this the fourth perfume in the men's range. Despite it being a men's perfume, I bought it for myself early this month. 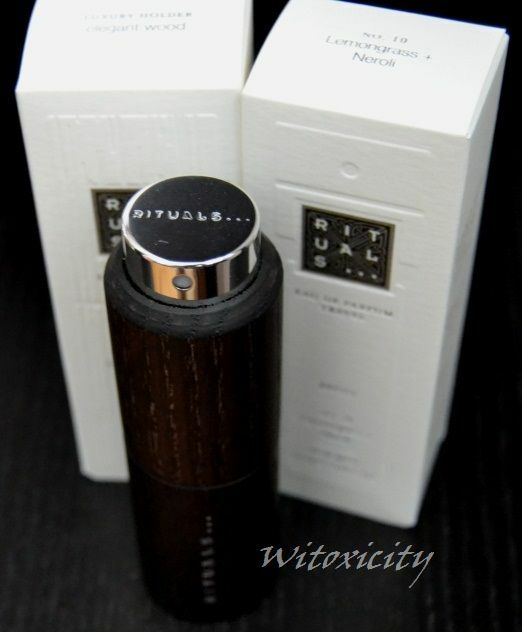 As mentioned in my post on the new Rituals Eau de Parfum Travel range - Luxury Holder and Refill Eau de Parfum Spray - I fell in love with this perfume right from the first spritz. I didn't even realise at first that it was a men's perfume (the display information wasn't up yet at the store). As I was quite captivated by the new Luxury Holders, I decided to buy this perfume in this travel format, priced at €14.90 for 20ml (the Luxury Holder costs €12.90 but there is currently a special price of €24.90 if you buy the two in a set). Pictured here is my Luxury Holder - Elegant Wood. 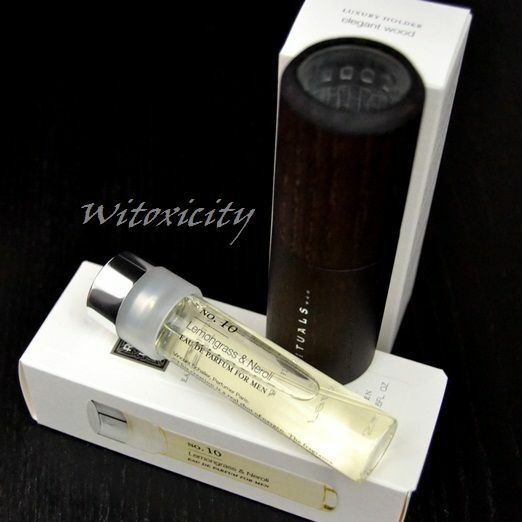 This perfume is now also available in the full-size bottle - €39.90 for 50ml. Just like in the women's range, these full-size bottles for the men's perfumes also come with a rustic wooden cap. This creation is real shot of oxygen. The fragrance is built around the extreme freshness of Lemongrass and the radiance of Neroli, with a citrus aromatic character and woody undertones. I can't quite put my finger on what it was that got me when I smelled No. 10 for the first time. I grew up with a robust lemongrass plant in the garden - it was very handy for when my mother wanted to cook a dish which required lemongrass. So, to me, it is a smell from my childhood and a smell that I always associate with southeast Asian cooking. However, I've never thought of lemongrass as a pretty scent. It is, well, just exotic, aromatic and only very slightly citrussy. In this No. 10 perfume, I think the lemongrass scent has been 'prettified' by the neroli. Let me put it this way: it brings back no memories of Asian cuisine. It starts off citrus swwwweet, heavy and, in my opinion, feminine. On my skin, it is powdery with a hint of cinnamon some hours later. What's left at the end of the day is a pleasant, bittersweet scent. This perfume lasts many hours on me. No. 10 may be meant for men but I find the fragrance as a whole to be too pretty to be a men's perfume. But that's just my nose. Nice article and I love the elegant perfume holder, very classy. "KTee"
Thanks, KTee. The Luxury Holder is the star here. I love it!